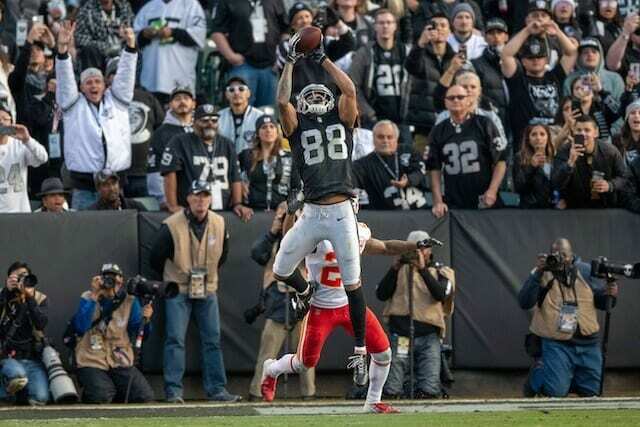 The Oakland Raiders announced on Monday that they have re-signed three exclusive rights free agents: wide receiver Marcell Ateman, kicker Daniel Carlson and offensive tackle Justin Murray. Ateman returns for his second season with the Raiders after being drafted in the seventh round (228th overall) in 2018 out of Oklahoma State. He was promoted to the active roster prior to Week 8 and appeared in seven games last season. He 15 receptions for 154 receiving yards and one touchdown. The kicking position was a problem for the Raiders at the beginning of 2018 before they signed Carlson and he brought stability to the position. The first-year player made 16 of his 17 field goal attempts in 10 games with Oakland in addition to all 18 of his extra point attempts. Carlson originally was a fifth-round pick of the Minnesota Vikings out of Auburn but was cut after just two games when he missed three of his four field goal attempts. In his time with the Raiders, he drilled all three of his attempts from 50-plus yards. Murray is also entering his second season with the Raiders after being claimed on waivers at the beginning of the 2018 season. He appeared in just two games as a backup on the offensive line. The Raiders began their first offseason workouts on Monday, so they got the signings done just in time to get all three players on the field with their teammates.